Cindy has tasked us with posting about our favorite word. Well crikey! This is hard stuff. A favorite word. Words have been rolling around in my head all week like rough pebbles. Giving me a headache in fact. I started to choose this obscure English term I always enjoy rolling on my tongue but that would be pretentious. I pick sunflower. A combination of two great words. The sun warms and brightens us and flowers cheer and color our world. Plus I have pictures! I think of sunflowers as country flowers. Generally they are tall and found on farms. The seeds are used for many purposes. One use I like is to feed birds. We feed birds at the yellow house and it is a labor of love. Joe grew sunflowers this summer. On the little hill at the yellow house. He planted them late and then the volcanic heat arrived, We did not know if they would survive. They did. They are not large but for a first effort we are mighty pleased. The bees certainly seem to appreciate them. The Word Sunflower Makes Me Smile. How about you? Joe’s sunflower’s do illustrate why I love this word as I do. What word do you like or love.? Join the link party at Cindy’s blog I Owe It All To Him and tell us all about it. Thanks bunches Cindy for this inventive party. A white and vintage table scarf found pressed and starched at a yard sale for two dollars. Add Joe’s milk glass. I found these three pieces scattered around the old house when we married. They might be his mother’s. 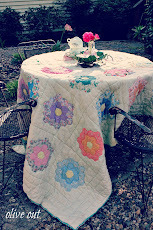 The embroidery on this table scarf is executed perfectly. The stitching is fine and I think the backside looks beautiful also. This could never be said of pieces I did in my twenties. Grouping the milk glass pieces together makes for a more cohesive look. I especially like the urn in the back. I was shopping for an ace wrap at one am and overslept and missed my magical sun in the window perfect moment. Please pardon my glare. The ace wrap I hope is not a blog for another day! 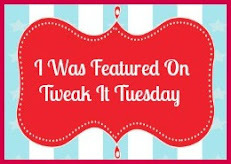 I am linking with Kathleen at Faded Charm for White Wednesday and at Coloradolady for Vintage Thingie Thursday. Please visit them for all the white and vintage goodness. An afternoon spent on the banks of the Savannah River with my daughter. We were on the South Carolina side looking over at Augusta, Georgia. The city planners in North Augusta are developing their side of the river nicely. They have allowed houses to be built but have left space for the public to enjoy the river. That is good planning folks. There is a walking area and a park. Meanwhile on the opposite side of the bridge on the South Carolina side there are some very large homes sitting right on the banks. Plus the required golf course. I care nothing for golf. Pure blasphemy in some parts I am aware. This little bridge was lovely in the shadows. I drove over the Savannah River every day to work at the hospital for twenty one years. Now I drive across to arrive at the yellow house. It is always pretty and somewhat mysterious. There is a section where it is so shallow you can walk across it into Georgia. We must put that on our to do list. I swam in this river in my much younger years. I do not think I would now. One of the homes on the Georgia side. They all have boat docks. They have boat races on the river in the spring which are very loud. CC and I had a great time walking along the banks taking photographs. You can see we stayed til dark. We went to an evening market and purchased goat milk soaps. Say that very fast several times…goat milk soaps…goat milk soaps…now you are dizzy…my work is done. They had many other wares for sale. We will revisit this river bank again and again. Oh my goodness, ya’ll, I am the guest artist over at Cindy Atkins blog today. I cannot grasp it. Me? Visit I Owe It All to Him to hear more about me the guest artist! There I typed it again and still cannot believe it! Thanks bunches dear Cindy! I was a Director of Nursing at a large prison in the state of Georgia. It was not a glamorous or a overly important job position. I believe I had six employees. We did care for fifteen hundred inmates and I used many agency nurses to assist us. One of my duties was to order and then to pick up the monthly supplies for the medical unit. It was usually quite the expedition. I was required to have an officer with me at all times. I also took an inmate orderly with me to lift the boxes. One of the medical orderlies, Mr. N had attained Trusty status which means his security risk was the lowest. Trusty inmates have not been in any trouble for many years and have no discipline reports. Which is good. We liked Trusty orderlies to work in medical and places like the Warden’s office. Mr. N was also a Christian. He was one of the rare felons who would look you in the eye and tell you he was guilty and deserved to be in prison. Everyone else was innocent, of course. One day Mr. N, the officer, and myself took off with a huge buggy to the laundry to get supplies. You had to go through the hot laundry room to get to the warehouse area. Before the warehouse is an anteroom. Almost a cage really. A prison is full of locked cages. I picked up the supplies. The buggy over flowed so a supply orderly was helping us. Several inmates and I were in the anteroom and the officer left me. He left me there in the anteroom with four felons and no one else. It was an awful breach of protocol. Yes, I was afraid. Then Mr. N stepped closer to me and said, “Nothing will happen to you as long as I am here” with quiet confidence. You see, he was respected because of his faith and how he served others in that place. He was also six feet tall and had huge biceps. Size is not always a factor however. I saw little guys fight like crazy in the prison system too. I witnessed the aftermath of stabbings and many terrible things I will not discuss further. My being left in that cage shook me. After that I demanded a radio. Which I was given reluctantly. A radio can save you in a bad situation and keep you informed of the happenings in that walled and gated city. I kept that radio with me. It was my buddy. Mr. N, though it was not planned, actually was moved to the prison I transferred to just before I retired. It was such a blessing to see him care for the sick inmates in our little prison hospital. He became a Certified Nursing Assistant via classes my supervisor taught. He has been released. He is home with his wife who stood by him through sixteen years of incarceration for robbing an ATM machine. They have nine children. He was my guardian angel that day. The reality of what could have happened is unspeakable. He stood in the breach. God placed him there for me that day. He was an answer to a quick prayer. I am linking with Cindy at I Owe It All to Him for her link party. Please visit and read the other accounts of how people have made a difference in the most special ways. To better understand Christ’s view of the care and treatment of prisoner’s read Matthew 25:31-46. White Petunias are the feature today for White Wednesday. Petunias tolerate the heat fairly well. They do not demand a lot of water. They were beginning to get leggy so I cut every other branch back and they bloomed beautifully again. That C-Cat crept into the last photo. He is a sly one. I am linking with Kathleen at Faded Charm for her White Wednesday link party. Please visit for more white goodness. One hundred and one degrees on our deck yesterday at the yellow house. This heat seems to be relentless. This chandelier, in a store front in Edgefield, South Carolina illustrates the situation perfectly. Happy Sunday from the C-Cat! This event is hosted by Cindy at I Owe It All to Him. Please visit and check out others favorite verses. It was difficult to pick a verse. Or even a set of verses. I chose Lamentations 3:22-23. I turn to this chapter many days. See two verses! It contains the title of one of my favorite classic hymns. for his compasssions never fail. I am in need of His never failing compassion. My faith, at intervals, could not be found on the surface of a mustard seed. I do not think Horton could hear it if it were a tiny Who. But His faith is great when mine is not to be found anywhere. This gives me no end of comfort. I can hear the old hymn now. The photo is from the Old City Cemetery in Sandersville, Georgia. Ya’ll have a peaceful and blessed weekend. Cloches. A party. At Marty’s. Over at A Stroll Thru Life. It’s a grand idea. I however, did it in a small scale. My cloches are not large. The contents are petite. I have always been drawn to tiny objects. My cloches do not usually reside in the window seat. I was chasing the light! The cake plate is Joe’s mother’s. The teapot is CC’s grandmother’s. I treasure them both. I will be looking for more cloches as I am officially cloche happy now. Have you ever met anyone who did not like wicker? I haven’t. Now I have seen some I might have been hesitant to sit in but it is all lovely. Some of the cheaper inexpensive wicker is not what I am referring to. Charleston, South Carolina Battery residents paint their wicker a dark green. I prefer the traditional white. I have recently seen a neat teal on wicker on some of the blogs. Whatever wicker color you have it is all yummy. Yes? I have this small wicker box on our dresser at the yellow house. It has this interesting bow. It is discolored in a few places and I am wondering if I should spray paint it or just leave it alone. What do you think? 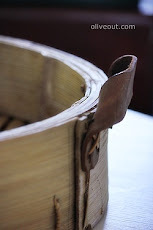 Then I look at the box or basket again and think maybe it is not wicker at all. No matter. I like it. It is useful to hold objects on my dresser. It is old and white. Which brings me to Kathleen at Faded Charm. The white part brings me to her not the old part ya’ll! I am linking to her for White Wednesday. 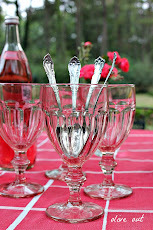 I am also linking with Suzanne for Vintage Thingie Thursday over at Coloradolady. The living room at our yellow house is small but cozy. I thought it was time I shared part of the interior of our vacation house with you. Nearly all the furniture is second hand. Including the rugs and lamps. All of the painting was done by me. The chaise and chair, covered in Waverly fabric, are from a yard sale in Pennsylvania. Joe’s brother used to live in Pennsylvania and we brought them all the way back home! The chaise is wonderful for napping. I cannot have enough lamps. Unfortunately, I am out of table surfaces to place them. We are not finished with our little house. we have a large antique buffet that will go in the dining room. It is currently in the hall at the old house. Is is nice to have the luxury of moving furniture between the two houses. The pineapple lamp is from a second hand store in Georgia. Joe’s brother Bob grew these beautiful flowers. Thanks Bob and Sue! The fireplace is looking a tad bare in these photos. I did acquire an item this past weekend that fits perfectly in this space that I will share later. Yes, I have a Charleston sweet-grass basket filled with baseballs in the background. I like a touch of whimsy. That basket starts a conversation every time we have a new visitor to our house! It is still dark in South Carolina. Our vacation is about to end. It was lovely. Fast of course. The temperature has cooled a bit. It is supposed to rain today. Yay! Here is a poem from a small book of poetry I read on occasion. The yellow house is now still. In a hour it will be noisy as CC and her friend Big A will wake and they are LOUD. Joe is quiet but he will egg those two on. Big A is not big at all that is just my nickname for her. Both of them were two pound premature babies and they are petite. We will all be going to the 8:30 service at church. Ya’ll have a peaceful and blessed Sunday. It’s time for Debbie’s Garage Salen Party at Debbiedoos. Go on over and visit. Look at the great finds. Joe and I will be setting out at 0630 in the morning. We are garage salen nuts, fools, crazed idiots,and generalized bargain hunters. I found this sweet little yellow quilt at my daughter’s best friend’s old high school yard sale. My goodness…I nearly could not get that sentence out! I had been looking for a throw for the den sofa. This crib quilt is exactly right for our pastel sofa. It is old and has some stains but is intact and did I mention I adore yellow? I painted the main portion of the yellow house a pale yellow. Like real butter. Old and found objects look wonderful against this color. This quilt is perfect! I usually do not wish to discuss pricing but I paid ten dollars for this quilt. I ran from the building as I was in a state of joy and confusion over that price. Ya’ll visit with Debbie at the Garage Salen Party here. We have counted five varieties of lantana in the yard at the yellow house. A pale lavender is about to bloom maybe next week. The butterflies, humming birds, and bees seem to feast on it. There is yellow, orange and yellow, pale orange with white and my favorite red with orange. Finally the pale lavender which we cannot fully appreciate yet. The red color, is positioned on our corner lot by the road for cars riding by to enjoy. We have no mosquitoes at this house and have heard that lantana wards them off. If this is true we certainly have enough to keep them away. Two of our specimens by the deck are taller than me! Now because I love him and baby him like a toddler, the C-Cat, in all his sleepy glory. It is to be a mere 105 degrees today. What to do? Blog away!!! Have a lovely and blessed weekend ya’ll! Strolling through a favorite thrift store close to the yellow house yesterday I spotted this curious green ceramic lamp. It is from the fifties I believe. It has one broken spot in the back, thankfully. I found the matching shade in another area of the store. I was so excited. Heart racing. I know that is weird. It did not work when I brought it home. Joe, bless him, rewired it. I think it will be placed on a white wicker table next to our crazy floral sofa in the den. For now I took photos by a window in the den with some oil paintings and Minerva, a little statue I found recently. Notice the matching trim on the shade. I like it! I am linking with coloradolady for Vintage Thingie Thursday. This is my first time linking to this event. I hope I do it correctly! Weight Loss Before and After!! !